Chancery Financial Advisors realizes that the one thing history can tell us about financial markets is that no-one can accurately predict the future direction of the markets. Our investing process, guided by the fiduciary principles of the Center for Fiduciary Studies, prepares us with the most relevant tools, techniques and information to help clients reach long-term goals. Our portfolios are tailored to each client’s financial needs, ability to handle risk, and desire for return. While client portfolios may be similar, none is exactly alike. We provide clients the investment solutions they need as we have access to hundreds of independent and institutional portfolio managers with specific management styles and areas of expertise such as equities, fixed-income, and real estate investment trusts (REITs). Performance of a client’s portfolio is measured against an appropriate benchmark to monitor manager performance. Clients have online access to performance and investing activity through our affiliation with Envestnet Asset Management, Inc. and it’s online platform. We make use of several custodians, depending in part on the client’s situation: Charles Schwab, TD Ameritrade, or Pershing. With no investment banking conflicts of interest, our recommendations are based solely on what we believe to be in the best interest of our clients. We focus on risk-adjusted returns in client portfolios. What does that mean? It means that we invest in a portfolio based on a combination of our clients' long-term goals and their ability to deal with real risk. Looking for a target rate of return without reference to how much real risk is being taken by the investor is a formula for frustration and potentially failure as the investor chases unrealistic, potential market returns. In the graphic above it’s clear that for each level of investment loss (the left side of the chart), the necessary return (the right side of the chart) to get back to breakeven (the center line) is higher than the original loss. 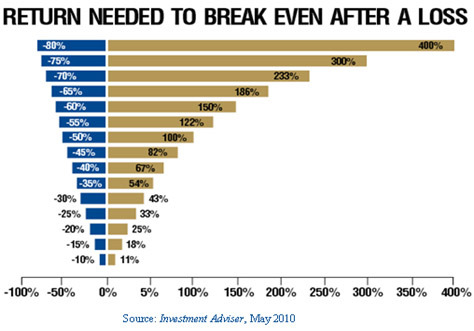 As an example, if the portfolio is down 15% it needs to earn 18% to hit breakeven. The problem is that the client will have to take a higher level of risk than the client is comfortable with and it increases the potential for greater losses. This clearly shows that while losses may be linear, returns to reach breakeven are geometric. Our strategic relationship (through Portfolio Resources Advisor Group - PRAG) with Envestnet Asset Management, Inc., the premier money management technology platform, gives you access to more than 1,600 portfolios from hundreds of top institutional and independent money managers. While many of these managers have portfolio minimums as high as $1 million per client, through PRAG you can access their expertise with as little as $25,000. Smaller levels of investable assets can take advantage of mutual fund and ETF portfolios - all of them with active management and supervision. Envestnet also provides performance reporting and billing for all advisory clients.